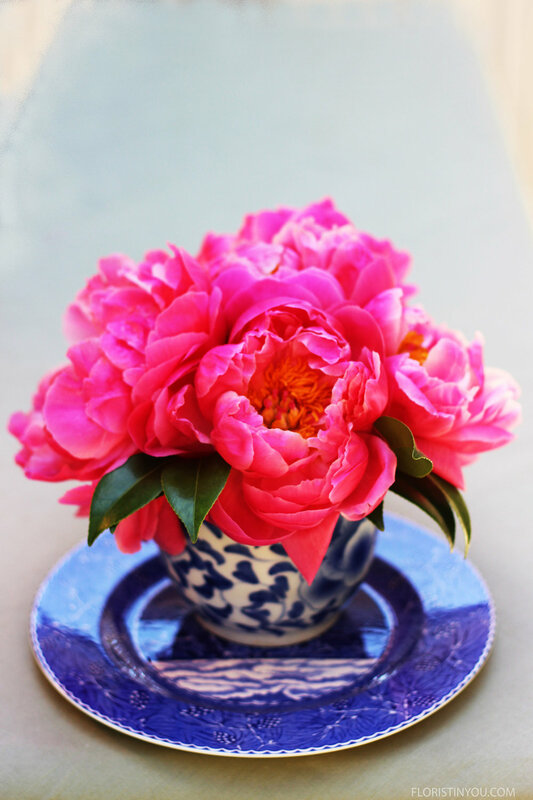 Welcome summer with this peony arrangement in blue and white porcelain. Really these peonies are to die for with their golden fringed stamens that look like the ties to a grand silk curtain. Wow. And paring them with the blue and white is a very classical look. You can buy a container similar to the one shown (click here). And you can buy a plate similar to the one shown (click here). Blue and White porcelain was made in China in the 14th century, after they bought the blue pigments from Persia. The first blue and white porcelain made in England was in 1742. See: https://en.wikipedia.org/wiki/Porcelain Spode, the manufacturer of the blue and white porcelain shown in the links above, started manufacturing the Blue Italian pattern in 1816. It is a classic. If you don't have some you can start collecting like your grandmother would say 'a piece a time'. Well run out and grab some peonies, your blue and white containers, and half a brick of floral foam. This one is simple yet stunning. 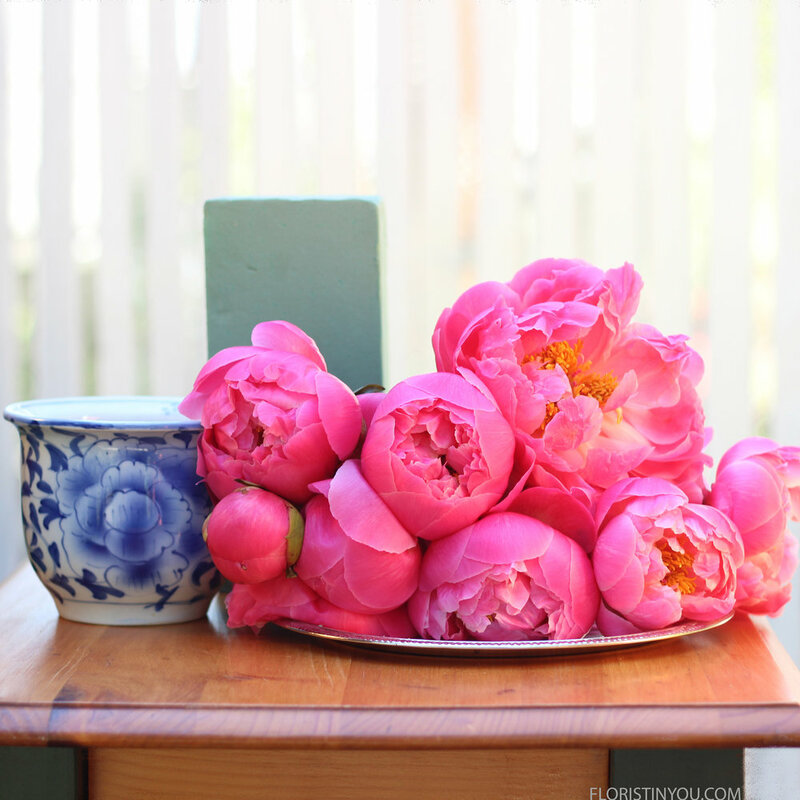 Here are your peonies and supplies. Cut floral foam with produce knife. Shape to fit in container. Pour water to half an inch below the top. Cut largest Peony 6.5 inches. Insert on an angle slightly to the right. Cut another large flower and do the same in the back. Insert another peony to the right of the one in front. Insert another to the side of the one in back. Now place one in the center, like so. 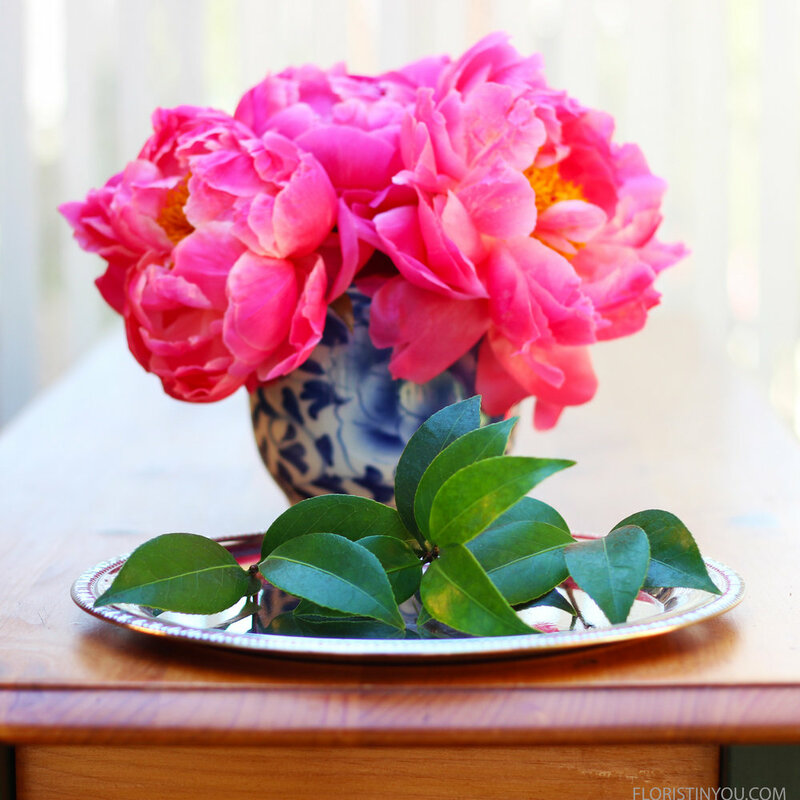 Put 3 or 4 stems of Camellia or Lemon leaves. Insert between peonies at the base of the arrangement. You're done. Here's the view from the top. Here's a close up of the stamens. The pink and blue work beautifully off each other.